Tonight I stumbled upon a blog called zyzcosmonaut. I have no problems spending a few nights aweek on reading and listening to blogs half as good and interesting as this one. But man, what a great blog this is! 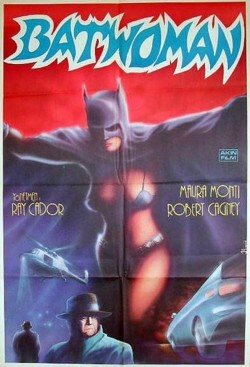 The plot: La Mujer Murcielago (aka Batwoman) is a heroine who protects the innocent of Mexico. Her foe is the evil Dr.Williams, who has been kidnapping wrestlers to use their brain material in his experiments to create fish men! Despite the trashy nature of such a film, this is probably the best movie Batwoman we’re ever likely to see and, even without the subtitles, is a far more enjoyable feature than the hugely disappointing Mystery of the Batwoman animated movie from 2003. Unless you have nothing else to do for the rest of the week, I would NOT click on any of the links in the above text, because I can assure you that you will find more great stuff than you can handle. And don’t be surprised when you find no new contributions to this Soundtrack for the next few days. Here is a tune that I found somewhere on one of the sites that I visited tonight, but I have no idea what it is or where it comes from.